Nice Post. Thanks.. I've tried the steps. but I can't see the message on the JMSQueue. I've sent the message thru the EM'S test console, but the message is not appearing in the JMSQueue. What must be the problem. Kindly suggest. Note:I'm using same version of SOA Suite and Jdev(11.1.1.5.). Do you see some activity on queue and did you paused the consumption of the queue. I Paused the consumption of the queue and there is no activity on queue. Just a few checks , is the mbean attribute still on jms and did you restart all the servers. I set the EdnJmsMode is true. I restarted the SOA Server and Admin Server. Paused the consumption of the queue. but can't see any activities/messages on queue. 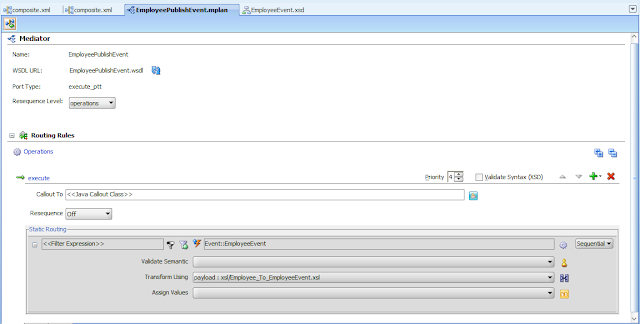 how do I publish Events to EDN using java? Hi Edwin just like Ananth I cant see anything going to the the EDNQueue. Just an observation, you started with the EDNQueue and when you restarted the server after the configuration it changed to SOAJMSModuleEDNQueue ?? Did you rename or is it a new Queue you created? 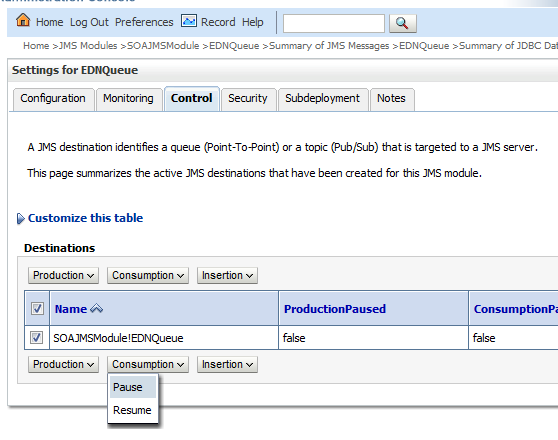 SOAJMSModuleEDNQueue is the name where the real implementation of the queue is running ( jms module / server ), in this case EDNQueue queue is running on the SOAJMSModule. I did realise that the QueueName wasn't the issue. But Not sure what we are doing wrong. I am running this on a SOA 11.1.1.1.4 with an admin and a managed server on my dev box. Are the following Queue settings correct ? Also even though it doesnt look like an issue with the code can you share your code so that I can see if there is anything in the configuration of the Event. I have managed to get this working... It worked once I deployed the listener code to the server. I presume that it was throwing away the messages if there were no subscribers to the queue. I would recommend you add that to the post. you said you deployed the listener code to the server..so, what is the code you are talking about here, is it the mediator service that listens ( subscribes ) to the queue as above or do we need a listener separate code. My requirement is i have to raise a business event. 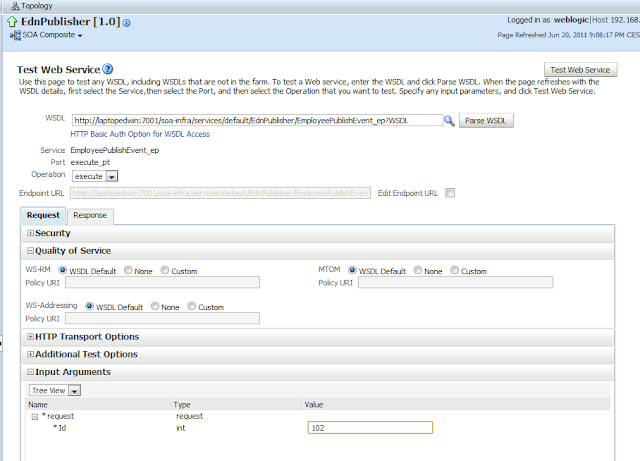 for this i wrote a JMS client as mentioned here in the post: http://biemond.blogspot.com/2011/06/publish-to-edn-from-java-osb-with-jms.html and could post the message to the queue. 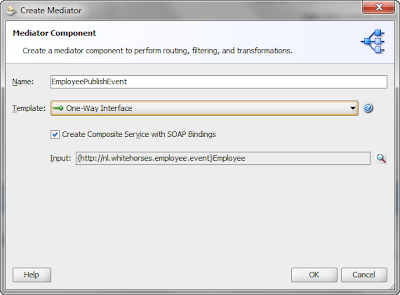 Now I created a mediator component as stated in this post with the configurations set to JMS. Now the mediator component is not listening to the Queue and the message is not getting consumed. So, do i need to run a separate listener class to subscribe to the queue ? Can't the mediator service consume the message from the JMS. Can you make a dummy edn produce and consume composite process and see if jms edn works. Dummy EDN produce and consume composite process works with JMS. 1.) From EM console I did set the EdnJmsMode to true. 2.) Created the Event Definition File. 3.) 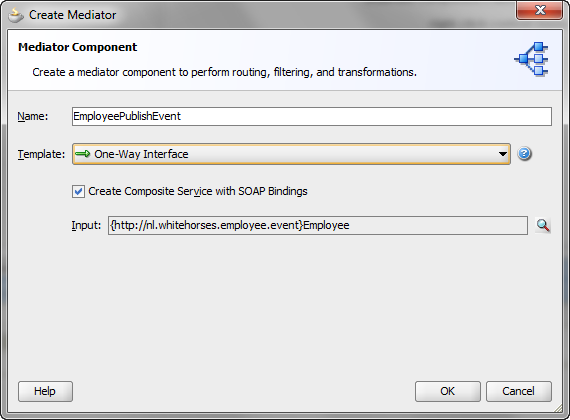 created a composite with Mediator to subscribe to the events and deployed the composite. 4.) 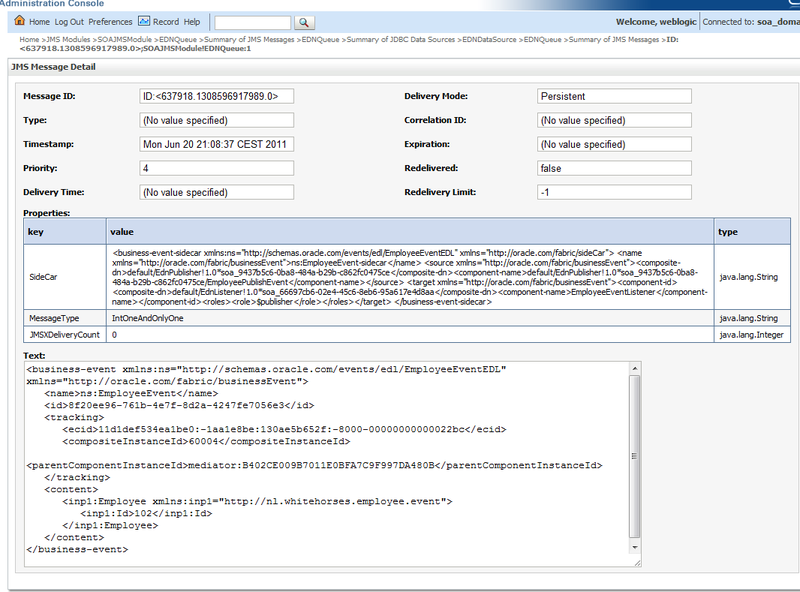 From the EM console, published the Business Event with sample payload. 5.) In the JMS queue i could see the message coming in and being consumed by the Mediator composite. Next is, i want to publish the Business Event from a JMS client, not from the EM console as we did in step 4 above and want to consume the message with the same Mediator Component we created above. So,I created a JAVA client to post the message to EDNJMSQueue (jms/fabric/EDNQueue ). Now as in step 5 above i could able to see the message in the Queue but not being consumed by the Mediator composite. Do i need to change any configuration in the Mediator Composite ? or Do i need to write a separate listener code to consume the message from the Queue. Since the message is being posted to the same EDNJMSQueue, can't the Mediator Composite consume it as in step 5 above. I might be missing something here, your help is appreciated. 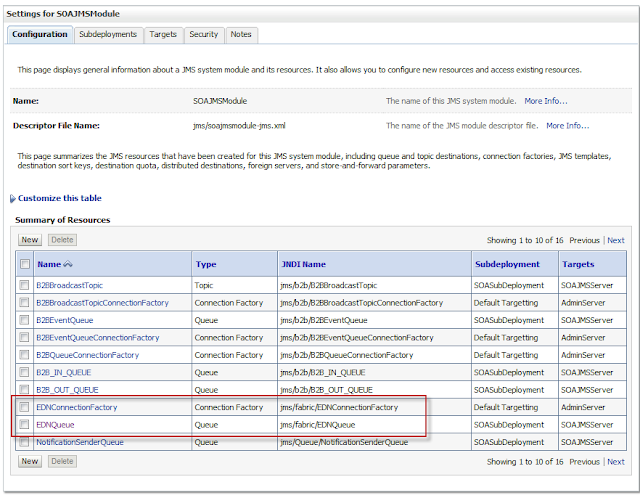 can you check the message and jms header properties this should be same as your dummy produce. and are you connecting to the soa server. you can also use a qbrowser to put the message direct in the queue. I am connecting to the soa server. Following are the header properties. The MessageType differs and the Sidecar content differs and i am using the same JMS client as in your other post, no change.. I am connecting to the SOA server. when using the qbrowser i the message is sitting in the Queue, but there the Message Type is missing. Message Type is always remote when you do it from outside the soa suite. Can you use exactly the same Sidecar and see if that works. and then remove some data until it fails. Publishing from java or OSB should lead to message in a queue and activity . This by passes SOA code. 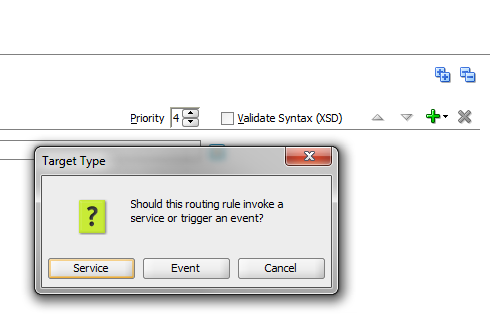 I followed the steps given in developer guide to publish events to remote web logic. I have created foreign JNDI as said. 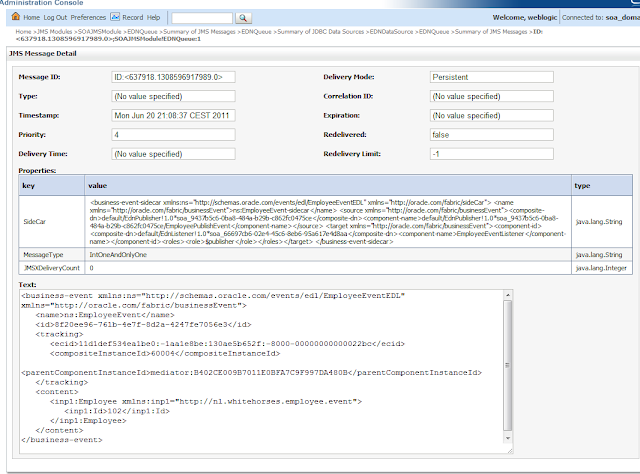 But Messages are not getting posted to remote weblogic EDN queue. If you have any documents related to this please share. 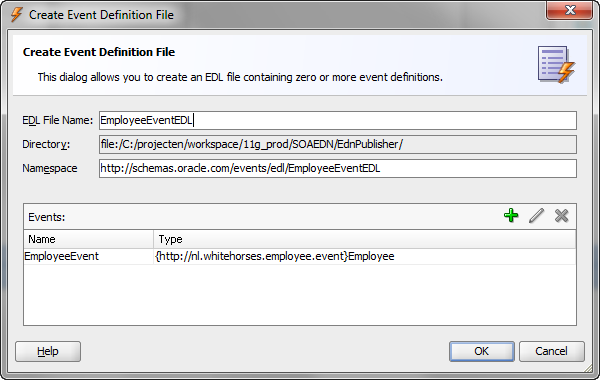 Do you have a composite listening for edn events and can you try to publish it from java. 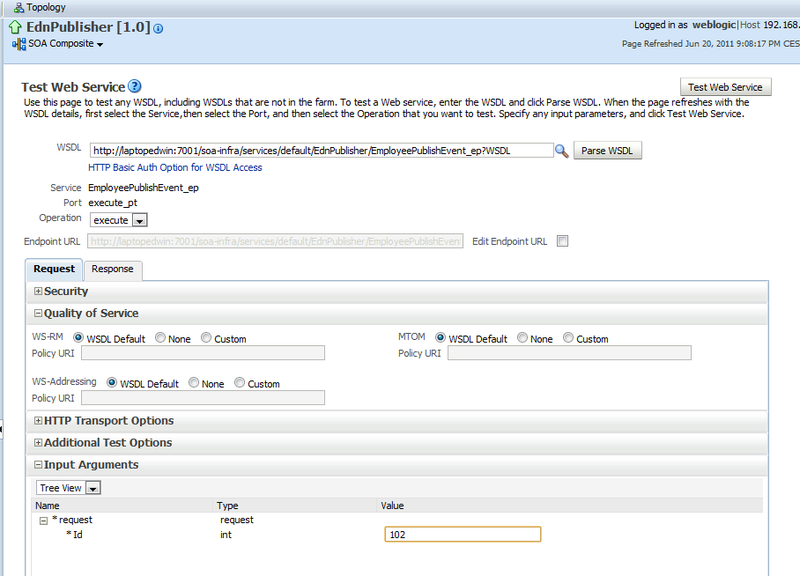 I am able to successfully publish the events to the JMS queue, using a BPEL process, but I tried all the steps you menetioed for Mediator, but it did not work not sure why. Anyways I have a question why the "Consumers Total" is 1458 in your above picture. In my case it is increasing after every second and it is now 6703, I believe these are the instances of the MDB's listing to this queue. but how come it is increasing after every second..
Can you deploy the mediator first and test the EDN event in the EM and after that deploy the BPEL producer. Crazy numbers indeed , looks like the soa JMS implementation is not so well developed. Does it stays so high and keep increasing. I got a question that you might be able to answer. I have been playing with WLS 12.1.3 and SOA 12.1.3. 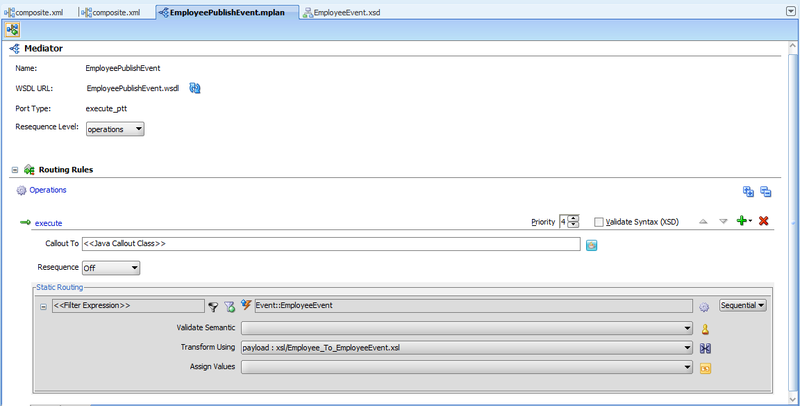 I have an ADF application and would like to publish Business Events on the EDN using JMS. Since SOA 12c, the event subscribers consume JMS messages from the EDNTopic instead of EDNQueue. So my question is: is there a way to setup my ADF application to publish EDN events to my EDNTopic without writing any extra Java code and overriding ADF BC Java classes? Also, you are doing a great job with this blog (and your other projects), thanks for that. Hi im also encountering this issue. Thanks for explaining the concept so well. 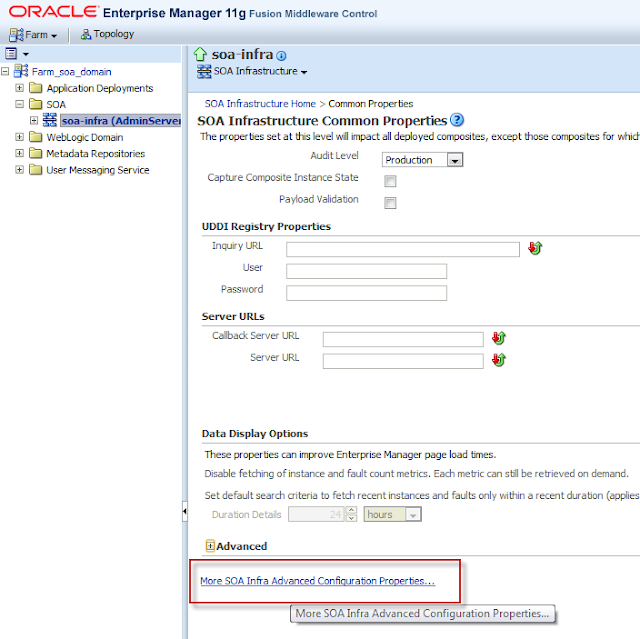 can you help in initiating an edn from plsql api in soa 12c..
Can we use mediator as subscriber EDN to JMS topic.